Historical Flags of the United States continue on Page II and Page III. Since there was no official United States Flag for the first year after the signing of the Declaration of Independence, there were a great number of homespun flag designs. This flag is without question the most well known of those. Fully sewn and embroidered nylon outdoor flag. 5'X8' has appliqued stars. Used in the Battle of Bennington, August 16, 1777, by Vermont militia. This flag is the first to lead American armed forces on land. The original is preserved in the museum at Bennington, Vermont. Fully sewn and embroidered nylon outdoor flag. John Paul Jones raised this Flag on the British frigate Serapis, which he had captured during the most famous Revolutionary naval battle on September 23rd, 1779, when his own ship, the badly damaged Bonhomme Richard, sank. Our 3'X5' Serapis is of outdoor nylon. In 1775 Christopher Gadsden was in Philadelphia representing his home state of South Carolina in the Continental Congress. "Col. Gadsden presented to the Congress an elegant standard, such as is to be used by the commander in chief of the American navy; being a yellow field, with a lively representation of a rattle-snake in the middle, in the attitude of going to strike, and these words underneath, "Don't Tread on Me!" Now offered in four sizes in outdoor nylon. The Cowpens Flag was named due to its presence at the Battle of the Cowpens in South Carolina, January 17, 1781. This flag was first carried by the Third Maryland Regiment which was part of the Continental Line of Maryland, Virginia and Georgia Regiments. The original flag is now at Annapolis, Maryland. Although the British flag underwent a number of changes in the 17th century, the St. George's Cross continued as the official national flag. For seagoing ships, however, the official banner was the Union flag (better known as the Union Jack), which combined England St. George's Cross with Scotland's St. Andrew's Cross (a white saltire on blue). In 1707, the Union flag became Britain's national land flag. As of that date, all of present-day Georgia was included within the area claimed by the second Carolina charter (1665), so the Union flag would have been the official flag of what would one day become Georgia. Ours is 3'X 5' of outdoor nylon. British Red Ensign AKA "Colonial Red Ensign" and "Meteor" Flag Queen Anne adopted a new flag for England and her colonies in 1707. The Kings Colors were placed on a red field. Cornwallis surrendered at Yorktown under this flag. The best known of the British Maritime flags, or Ensigns, which were formed by placing the Union flag in the canton of another flag having a field of white, blue or red. This flag was widely used on ships during the Colonial period. 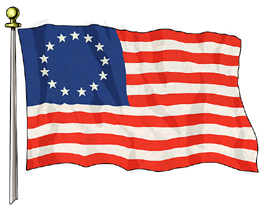 This was the first National flag of the United States. This 3'X5' British Red Ensign Flag is constructed of durable outdoor Nylon material. Navy Regulations, first promulgated in 1865, prescribed the use of the jack. It is displayed daily from the jackstaff of all U.S. naval vessels in commission, from 8 a.m. to sunset while the ship is at anchor. Additionally it is flown to indicate a court martial is in progress, and as the President's and Secretary of the Navy's personal flag. This powerful American symbol was used by the Continental Navy in 1775 and is being used again by the U.S. Navy in the War on Terrorism. Our 1st Navy Jack is 3'X5' outdoor Nylon. This flag was flown by the defiant citizens of Gonzales in November of 1835. The flag was hoisted to dare the troops of the Alamo de Parras Company under the command of Mexican Lieutenant Francisco Castañeda to repossess a cannon that had previously been given to the citizens for protection from Indian attacks. Though this skirmish was militarily inconsequential, as an act of defiance, it began the Texas Revolution. In the not too distant future, you may be required to surrender some or all of your guns to the police or military. How will you respond? About 165 years ago, early Texans faced the same dilemma. This Flag was born from that struggle. The 'Come & Take It' Flag we offer is 3'X5' made of outdoor Nylon. This Flag can Take It! The Mexican constitution of 1824 gave the people of Texas rights similar to those enjoyed at the time by the citizens of the United States, but every new Mexican government attempted to increase control over Texas. To call attention to this, Texans removed the coat of arms from the center of a Mexican flag, and replaced it with the date of the constitution. It was this banner that flew from the walls of the Alamo. "Remember the Alamo" with our 3'X5' outdoor nylon Alamo Flag. During the War of 1812, this flag flew aboard Oliver Hazard Perry's flagship "Lawrence" while commanding an American squadron in the Battle of Lake Erie on September 10,1813. Perry had named his ship after Captain James Lawrence, the hero of an earlier sea battle off New England whose dying words were "Don't Give Up The Ship". Our "Don't Give Up the Ship" 3'X5' outdoor nylon Flag will keep your crew motivated! The history of the Pine Tree as a symbol of New England probably predates the european colonial settlements.In eastern Massachusetts, southern New Hampshire and the southern corner of Maine, there lived a nomadic tribe of Amerindians known as the Penacook. "Penacook" is an Algonquin word meaning "Children of the Pine Tree." The Penacook people have been credited with teaching the Pilgrims, those settlers of the Plymouth Colony of Eastern Massachusetts, much needed survival skills when the colonists were starving to death during the winter of 1621-22. Volumes have been written about the battle of Bunker Hill, but we have no real knowledge that any American Flag was flown in this battle. John Trumbull, whose paintings of Revolutionary War scenes are widely famous, was an eye-witness and his subsequent drawings depicting the battle prominently displayed this flag. 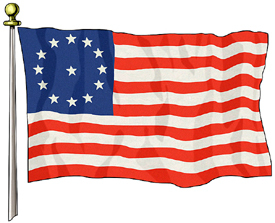 Our Bunker Hill Flag is 3'X5' in durable outdoor nylon. The Continental Flag uses a version of the British Red Ensign or Meteor Flag with a green New England Pine Tree substituted for the Union Flag in the canton. The Continental Flag is believed to have been carried at the Battle of Bunker Hill. As an eyewitness to the battle, Colonel John Trumbull painted "The Death of Warren" currently at the Yale University Art Gallery, which includes the Continental Flag. His depiction shows the red Continental Flag to be the one used by American forces at the Battle of Bunker Hill, June 17, 1775. Our 3'X5' Continental Flag is constructed of durable outdoor nylon. It was June 1846 when American settlers in California revolted and proclaimed an independent republic. They raised a Bear Flag that had a star and stripe from "Old Glory" and a silhouette of the California Grizzly. This flag was a republic flag for one month before being replaced by the Stars and Stripes and eventually became the state flag of California. Our historic California Republic Flag AKA "Bear Flag" is 3'X5' constructed of outdoor nylon. 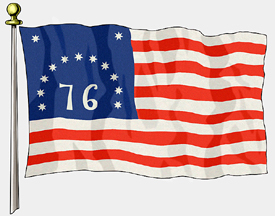 The Grand Union 1775: Also known as the Continental flag, it is the first true U.S. Flag. 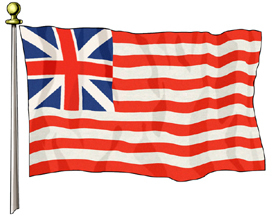 It combined the British King's Colours and the thirteen stripes signifying Colonial unity. George Washington liked this design so well that he chose it to be flown to celebrate the formation of the Continental Army on New Years Day, 1776, on Prospect Hill in Somerville, near his headquarters at Cambridge, Massachusetts. Ours is an outdoor nylon, 3' X 5'.